The recordings that ended up on You And I are intimate, immediate demos that illustrate Buckley’s gift for transformative interpretations. “He ingested them and they came out Buckleyized,” Berkowitz says. “Yeah—‘Put on the Buckley filter.’ Unfortunately, there was only one of them.” He laughs. “There was a limited supply. You can’t go out and get the Buckley filter, or the Buckley panel. Doesn’t exist.” But sonically, the seeds of Grace were also there on You And I. There’s an early recording of the title track that possesses the undulating, intricate structure and searing vocals of the final version. And two of the songs on You And I—a piercing take on Bob Dylan’s “Just Like A Woman” where Buckley’s singing acrobatics are evident, and a lovely solo acoustic version of The Smiths’ “I Know It’s Over”—actually stem from the Grace Bearsville sessions. Even today, Grace feels beamed in from some alternative universe, with very few signifiers identifying it as a 1994 record. The gnarly funk rocker “Eternal Life” would’ve fit seamlessly on modern radio at the time, although its orchestral flourishes elevate it beyond grunge level. “Mojo Pin” is a jazz- and blues-rock-influenced song structured like a classical piece, what with its multiple movements and recurring musical motifs. Strings and needling riffs swoop in on the waltzing title track—which, like “Mojo Pin,” was co-written with Gary Lucas, Buckley’s one-time bandmate in the band Gods And Monsters—while a stunning take on “Lilac Wine” cemented Buckley’s chanteuse reputation. And the mysterious “Dream Brother” ends the record on an uneasy note, where anguished post-rock guitar, well-placed percussion, and psychedelic shimmers convey mystery. 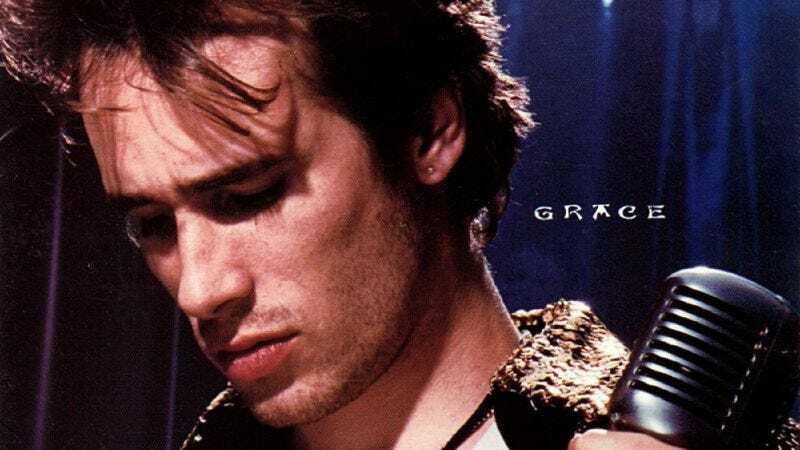 Perhaps most notably, Grace’s lyrics are inseparable from (and intertwined with) its music and arrangements, used as poignant shading and thematic nuance to enhance the album’s overarching emotional thrust. The record takes the perspective that ill-fated trysts (and the subsequent heartbreak) are deeply romantic, almost more intoxicating and exhilarating than the actual love affair itself. As a result, Grace‘s originals are more like ornate poems than linear narratives, with images of beautiful (but formless) women, brilliant nighttime scenes, ephemeral physicality, and even death used to convey drama and anguish. All of this, of course, dovetailed perfectly with Buckley’s agile voice. “When he would sing the really high notes that would go on and on, I always call it the Flying Buckleys,” Berkowitz says. “‘Here come the Flying Buckleys.’” On the title track, he leaps between sounding like a conspiratorial folk singer, a swaggering rock frontman, and a grizzled bluesman, while on “So Real”—which Buckley finished later after leaving Bearsville with guitarist Michael Tighe—there’s grit and gravity in both his upper and lower register, in a nod to the song’s stormy dynamics. His keening falsetto is even more prominent on the solemn, hymn-like “Corpus Christi Carol.” Even if (and especially when) Grace‘s songs meandered, Buckley had the ability to command attention and focus. Buckley toured heavily behind Grace, a schedule that included a mix of headlining shows and opening slots, and played alongside artists such as Juliana Hatfield and Soul Coughing. His sterling live reputation didn’t translate to immediate U.S. sales, however: Grace peaked at No. 149 on the Billboard album charts, and didn’t go gold until 2002. Only “Last Goodbye” made inroads at alternative radio and MTV. (The album was critically acclaimed in the U.K., however.) Still, Buckley’s cult of personality grew, and he was in the midst of recording an anticipated second album in 1997, when he died due to an accidental drowning in Memphis’ Wolf River at the age of 30. In the nearly two decades since his passing, Grace has taken on a mythic sheen, in part because it was the only full-length Buckley completed himself, and in part because of his premature death. But the slow-burning popularity of his cover of Leonard Cohen’s “Hallelujah” has also buoyed the record. Initially, the version wasn’t for everybody—a Chicago Tribune review said it was “ a masterpiece that Buckley wholly inhabits,” although Rolling Stone felt “he doesn’t sound battered or desperate enough to carry off” the song. Yet “Hallelujah” kept stubbornly cropping up in movies and TV shows, and began resonating with entirely new audiences. For example, after Jason Castro performed the song on a March 2008 episode of American Idol, the song rocketed to No. 1 on the Billboard Hot Digital Singles chart—selling 178,000 downloads that week as a result—and Grace landed at No. 10 on the Top Pop Catalog chart. Buckley’s “Hallelujah” went platinum a few weeks later. In 2014, the song was inducted into the exclusive Library Of Congress’ National Recording Registry, a collection featuring less than 500 items. It’s tempting to establish a direct correlation between his death and the song’s rise in popularity. And while that no doubt is a contributing factor—there’s an otherworldly, twilight vibe to the song that’s still haunting today—it does the performance a disservice, and undermines Grace‘s beauty and appeal. The album is a wholly original, gorgeous statement, separate and apart from both Buckley’s mythology and the period in which it was created.